Art and Max. Weisner, David (2010). NY: Clarion Books. ISBN: 9780618756636. In an empty desert, two lizards playfully explore the creative process. 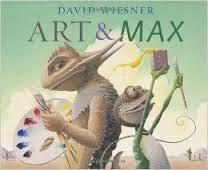 Max wants to be an artist like Arthur, but his first attempt at using a paintbrush sends the two friends on a whirlwind trip through various artistic media, with unexpected consequences. Clementina’s Cactus. 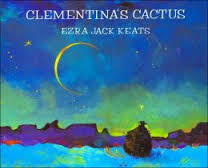 Keats, Ezra Jack (1999). Set in the Southwest. NY: Viking Juvenile. ISBN: 9780670885459. Clementina and her father are out for a walk in the desert when Clementina discovers a lone cactus, all shriveled and prickly–but with something beautiful hiding inside. Wordless book. A Cowgirl and her Horse (2011). Adams, Jean Ekman. Tucson, AZ: Rio Chico. ISBN: 9781933855714. 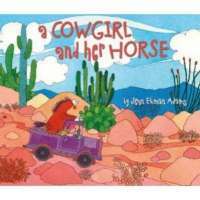 In the Arizona desert, a young cowgirl demonstrates her unique way of caring for her horse, from feeding him hay sandwiches to helping him pick out new shoes. 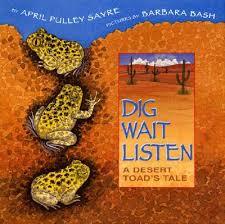 Dig Wait Listen: A Desert Toad’s Tale. Sayre, April Pulley (2001). Illustrated by Bash, Barbara. NY: Harper Collins. ISBN: 9780688166144. Under the sand, a spadefoot toad waits for the sound of rain. She remains in her burrow as other desert creatures pass above her but finally emerges to lay her eggs when the distinctive patter of rain begins. 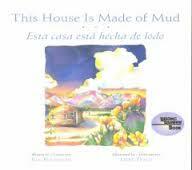 This House is Made of Mud. Buchanan, Ken (2004). Illustrated by Tracy, Libba. Flagstaff, AZ: Northland Publishing Co. ISBN: 9780873585804. A family builds an adobe house in the middle of the desert. 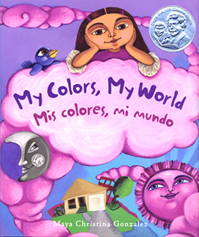 My Colors, My World/Mis colores, mi mundo. Gonzalez, Maya C. NY: Lee & Low. ISBN: 9780892392780. Maya, who lives in the dusty Mohave desert, opens her eyes wide to find the colors in her world, from Papi’s black hair to Maya’s red swing set and the fiery pink sunset. Bilingual Spanish/English. 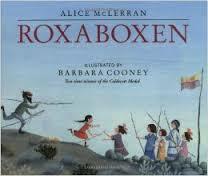 Roxaboxen. McLerran, Alice (2004). Illustrated by Cooney, Barbara. NY: Harper Collins. ISBN: 9780060526337. Children create a town from old crates, rocks, and an endless supply of imagination on a rocky Arizona hilltop in Yuma. A celebration of imaginative play. The Seed and the Giant Saguaro. Ward, Jennifer (2003). Illustrated by Rangner, Mike. Flagstaff, AZ: Rising Moon. ISBN: 9780873588454. A packrat, carrying fruit from the giant saguaro, is chased by various desert animals and inadvertently helps spread the cactus’s seed. Includes information on saguaros. 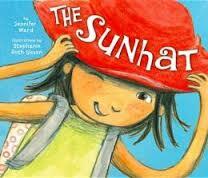 The Sunhat. Ward, Jennifer (2013). Illustrated by Sisson, Stephanie Roth. Tucson, AZ: Rio Chico. ISBN: 9781933855783. Way Out in the Desert. Ward, Jennifer. Illustrated by Spengler, Kenneth J. Flagstaff, AZ: Rising Moon. ISBN: 9780873588027. 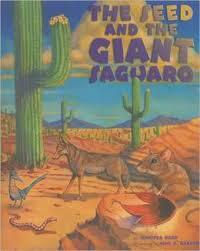 A science book with Information about the many plants and animals of the Sonoran Desert.